“Both are good men,” Trump said, referring to Strange and Moore. He specified that his decision was about loyalty and picking a candidate that could win in a general election. “Luther will definitely win … Roy has a very good chance of not winning in the general election,” Trump said. But he promised that if Moore won the primary, he would be “campaigning like hell” for him in the general election. Trump spoke at length about Strange, pointing out that he was easy to work with and helped him support his agenda in Washington, DC. Despite deep skepticism from grassroots conservatives about his credentials, Trump repeatedly insisted that the senator would help him achieve his agenda. “Luther Strange is determined to drain that swamp,” Trump said. Trump also tried to distance Strange from Senate Majority Leader Mitch McConnell, although McConnell endorsed him. 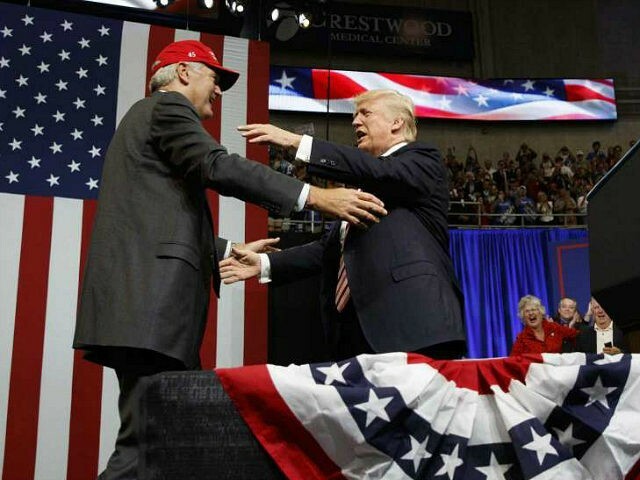 “He’s not a friend of Mitch McConnell … he doesn’t know him, he just got there!” Trump exclaimed. The McConnell-aligned Senate Leadership Fund Super PAC has spent $8 million in the Republican primary to help Strange win. Trump admitted that Strange was damaged politically after he was appointed to the Senate seat by former Alabama Governor Robert Bentley after then-Senator Jeff Sessions took a job in the Trump administration. “The fact that he was appointed, hurt him,” Trump said, but noted that he had done a “hell of a job” representing the state in a short time. Trump said that it was fine if some of his friends and supporters preferred Moore over Strange, but joked that he might have to fire them.